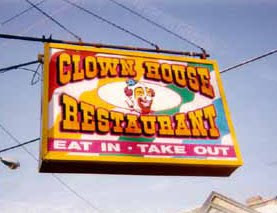 If you're in Philly this weekend and are looking for a place to eat, consider Pete's Clown House Restaurant. Let's take a closer look at the sign's graphics, shall we? Pete's Clown House. Where fear and trembling are just part of the menu.